A few weeks ago, you probably heard the harrowing tale of a man who was snowbound in his car and had to live on Taco Bell hot sauce packets. The story finally confirmed that, though people are always saying that man cannot live on hot sauce alone, he definitely can. Now, in light of a second life-saving-hot-sauce incident, it's starting to seem like everyone ought to keep a few spare Fire sauces on their person. 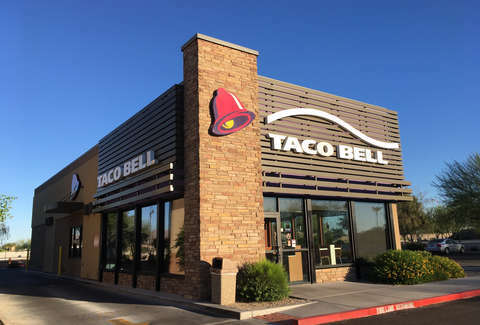 A man was getting ready to devour a lovely meal at a Taco Bell in Winter Haven, Florida when he realized that he needed hot sauce. He got up to get some, and moments later a car drove straight through the Taco Bell and slammed right into the table the man was just sitting at. According to a report from WTSP, the vehicle was driven by a 77 year-old who was parked with his wife in front of the restaurant. The man explained to the police that he somehow put the car "into reverse but then back into drive and it jumped the curb into the building." Thankfully, there were no injuries. Let this be a lesson to all of you. Though we're really sure what the lesson is. Maybe grab a few extra packets the next time you're at Taco Bell?